The best portable air conditioner is easy to maneuver (wheels and deep handles), simple to program (a working remote and clear displays), and aesthetically pleasing enough to be a permanent fixture for the summer. We brought in eight well-reviewed machines from trusted brands to try for ourselves and ended up with three favorites that will cool rooms of any size. The best way to discover issues in performance with any large appliance is to live with the unit on daily basis; we wanted to seek out units that had customer-confirmed efficacy. We started with some of the most reputable and consistently recommended brands: Whynter, NewAir, LG, Honeywell, Haier, Frigidaire, Friedrich, DeLonghi, and BLACK+DECKER. More obscure brands like Soleus Air and Arctic Wind didn’t have the kind of following or online presence to allow us to gauge reliability. We then combed through user reviews and looked closely at best-selling, well-reviewed, and renowned units, pulling models with a variety of BTUs and number of hoses — aka, units that will work for a variety of room sizes. (For more on BTUs, check out our guide below.) 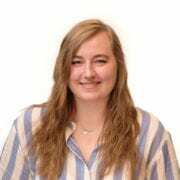 We didn’t consider any product with fewer than three stars, products with a troublingly high number of one-star reviews, or products with fewer than five models in stock. 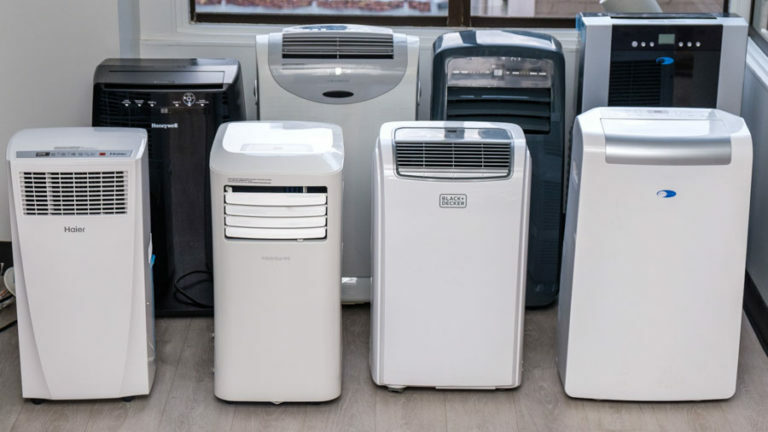 After scouring the market, we brought in eight popular portable air conditioners from the most well-reviewed brands at a range of price points, BTUs, designs, and sizes to test for ourselves. The whole point of a portable air conditioner is that you can move it anywhere you need it. Deep handles, smooth wheels, and slim profiles are huge boons in this department. For instance, the Haier had the best handles of the models we tested because they indent about an inch — double the depth of our other contenders — which makes for solid gripping. The Frigidaire’s handles, by comparison, are angled so sharply that our fingers kept sliding out. And the dual hose Whynter ARC-14SH doesn’t even have handles, despite being the largest unit. We struggled to maneuver it even across flat surfaces without bumping our shins or tipping it over, as the wheels also aren’t stable. Adjusting temperature and fan speed should be simple, and doing so from the comfort of your couch or bed should be, too. Control panels with large LED displays, uncrowded buttons, and clear labeling were easier to use. In general, we preferred remotes with LCD screens in order to clearly see what we were programming. We also favored remotes that functioned at a wide range — some, like the Honeywell’s, only worked directly in front of and within a few feet of the unit. Detailed LCD remotes gave us more control than those like the Honeywell's. While not necessarily a dealbreaker, we did take the general aesthetics of each unit into account. 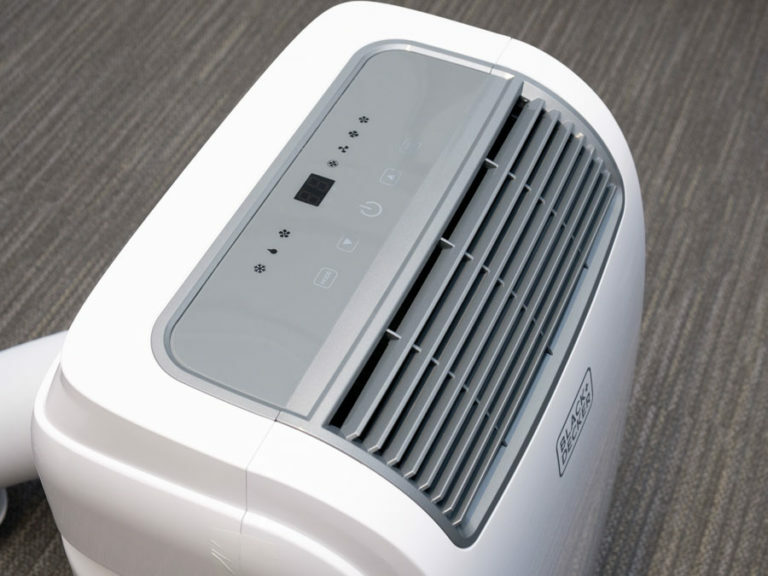 In most cases, your portable air conditioner will remain a fixture in whatever room you need it — simplicity, curved edges, and smooth exteriors all keep your portable air conditioner from being too much of an eyesore. While not strictly necessary, we gave extra points to units with additional features that aid in storage or air circulation, like cord wraps and oscillating fans. While manually adjustable fans were a nice feature, they were hit or miss; the Whynter fan’s plastic vents, for example, felt so weak that we were sure we’d break them as we shifted their direction. Although you can manually change the vent direction of the Whynter ARC-14SH, we felt at risk of breaking it with every adjustment. We loved features like sleep and energy-saving modes, as well, which automatically adjust the fans to lower noise levels. In units without a sleep mode, consumers complained that air conditioners would wake them up as they turned on and off during the night. You won’t be deprived without these additions, but their thoughtful convenience took some units the extra mile. This unique unit facilitates air circulation and makes transport painless. Even as we unpacked the LG, it was making life simpler — in other models, we spent chunks of time struggling to twist together hoses and attach them to units, but the LG arrived almost entirely pre-assembled. This ease of use extends to common maintenance tasks: It features clear labels for locking in and releasing your exhaust hose, opening and closing the drain, and removing the filter. It also hosts a cord wrap, built-in remote storage, and grippable handles. 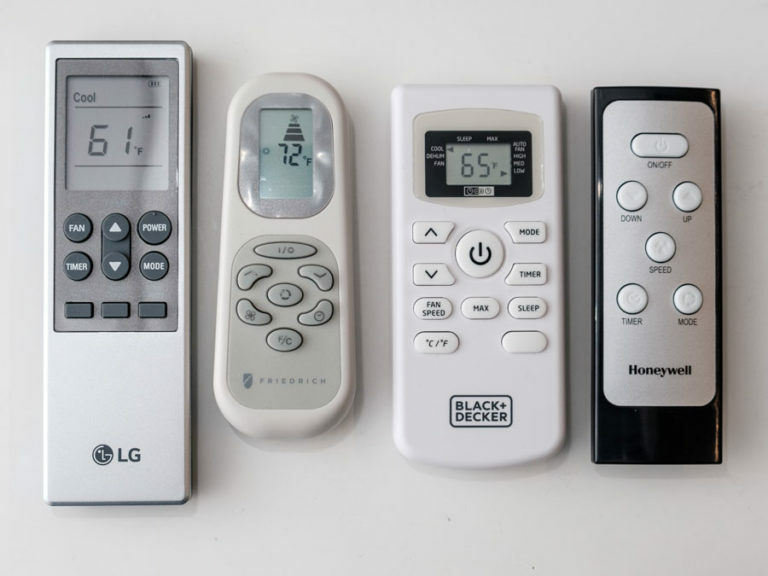 The LG remote is the largest of the bunch — think Blu-ray player remote vs. key fob — but this is because it features a large digital display that shows current settings. This made it far more intuitive than other remotes, which often feature unlabeled symbols. As a bonus, each button press elicits a friendly chime rather than the typical monotone beep of other units. 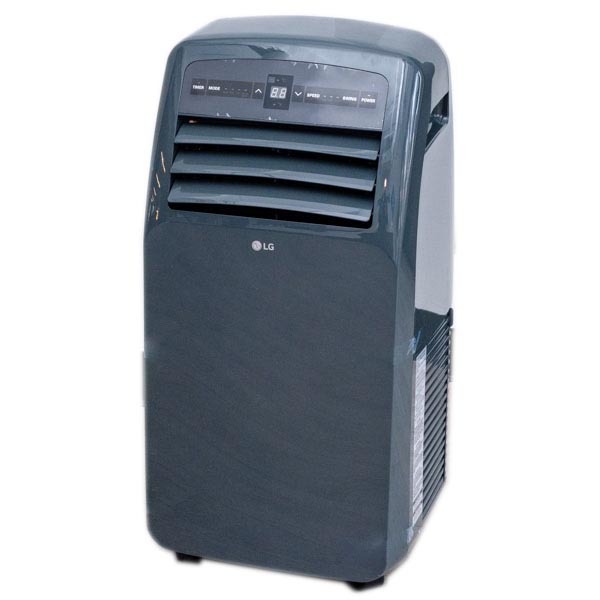 Modes unique to the LG include an Energy Saver mode, which only initiates fan cycles when when the temperature of the room rises, and an Auto Clean mode that removes moisture from the heat exchange coils, prepping the unit for storage and preventing any mold buildup. With other models, you’ll have to facilitate this yourself by running the machine on a dry fan mode for several hours. But our favorite programming option? An “auto-swing” mode that automatically oscillates the fan for optimal air circulation. It’s a feature so handy we’re baffled it isn’t standard for all units. Unfortunately, the LG is among the loudest of our contenders. If you’re the kind of person that can fall asleep to the sound of fan vents and white noise, it might not be a huge problem. However, if you’re a light sleeper, you may be sensitive to this machine — especially on higher fan speeds. We wouldn't consider the LG ugly. However, it is far more utilitarian in the overall presentation and won’t be winning any awards for modern design. With a prominent vent and blocky front-facing buttons, it lacks a modernity that models like the Honeywell impressed us with. A compact unit with a simple console for quick programming. As the lightest and smallest of our picks, the box-shaped BLACK+DECKER BPACT08WT is best suited for storage, mobility, and small spaces. If you live in a studio apartment, lack storage space, or want to cool a child’s bedroom, the BLACK+DECKER is uniquely size-conservative. The BLACK+DECKER’s cord wrap is ideal for winter storage and hazard-free transport up and down stairs, and though its handles aren’t as cavernous as those of the LG or Friedrich, it’s enough grip to scoot around a living room. The BLACK+DECKER was one of the smallest units we tested, nearly half the height and depth of models like the Whynter. With just five buttons and one display screen, the BLACK+DECKER has the simplest control panel of the bunch, which makes for quick and thoughtless programming. The calculator-like remote is intuitive, offering a few more features not accessible on the control panel. 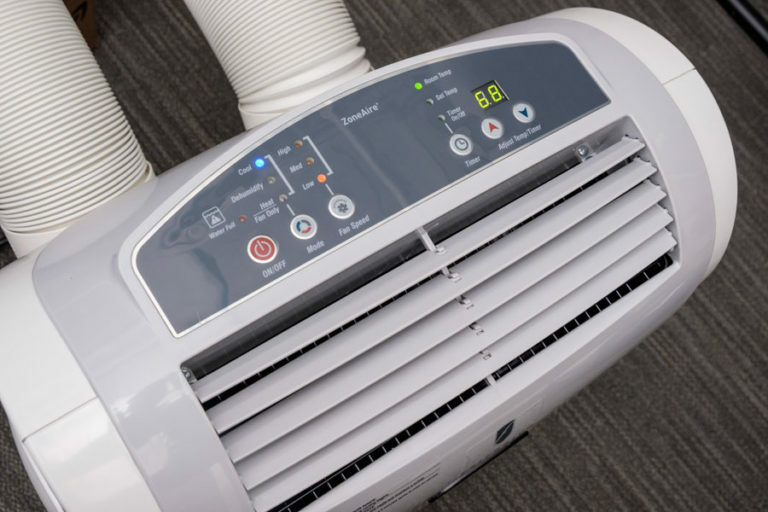 Of these is a one-of-a-kind “Max” mode, which automates the fan speed and sets the temperature to the lowest possible — great for when you’re coming in from the summer heat and need quick relief. We also appreciated the inclusion of Sleep Mode. While not a feature unique to this unit, it’s invaluable if you are a light sleeper. Upon activation, Sleep Mode dims the LED lights on the display and operates the unit at a quieter fan speed. Furthermore, the unit will shut off after eight hours. The lack of an oscillating fan doesn’t make this unit any less capable of cooling a room. However, without oscillating fans, it might be a little more difficult for cold air to circulate. The curved front-facing vent mitigates some of this, widening the cold air output to the room, but it might take a little longer (and a little more energy) to get the room temperature just right. The BLACK+DECKER is also notably lacking a remote holder. While not a dealbreaker, this feature is convenient if you frequently misplace remotes, and it makes winter storage a lot easier. Colorful buttons, smooth wheels, and two hoses to cool large rooms with ease. If you need to cool a large area or a kitchen, the massive Friedrich PH14B air conditioner is capable of tackling rooms up to 700 square feet. This is because it features a whopping 13,500 BTUs and two hoses, making it the optimal portable air conditioner for cooling large spaces. We had no problem working the Friedrich, thanks to the crisp display panel and the fob-like remote. While the remote design looks a little dated and features ambiguous symbols, we still preferred this over remotes that lack screens entirely. The Friedrich’s on-unit display more than makes up for the remote, with clear and color-coded buttons for each function. In order to drain moisture that builds up in the machine, this Friedrich model also features a built-in drain pump that allows you to connect a small drain hose to the panel in your window — other units typically require you to open up the unit and empty a drainage bucket. To know when you’ll need to drain the unit, the Friedrich includes a “water full” notification light, a feature absent from other models. The biggest drawback of the Friedrich? It’s a hefty 95 pounds. It is easier to manage than other dual-hosed units, thanks to its grippable handles and smooth wheels, but it’s likely a two-person lift — and harder to carry up and down stairs. The Friedrich is also not the quietest portable air conditioner on the market: not surprising, considering how heavy-duty it is. This was particularly noticeable during the cooling mode. In this mode, you can’t program a lower fan speed until the machine has reached your desired temperature. That’s usually when it’s the loudest and, until it reaches that temperature, you’re stuck with a noisy fan. 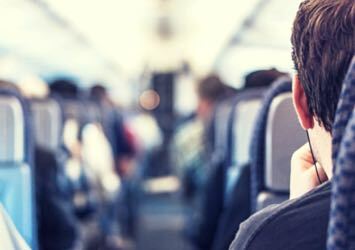 The most important factor in choosing your portable air conditioning unit is its British Thermal Unit (BTU) rating: the amount of heat necessary to raise the temperature of one pound of water by one degree Fahrenheit. 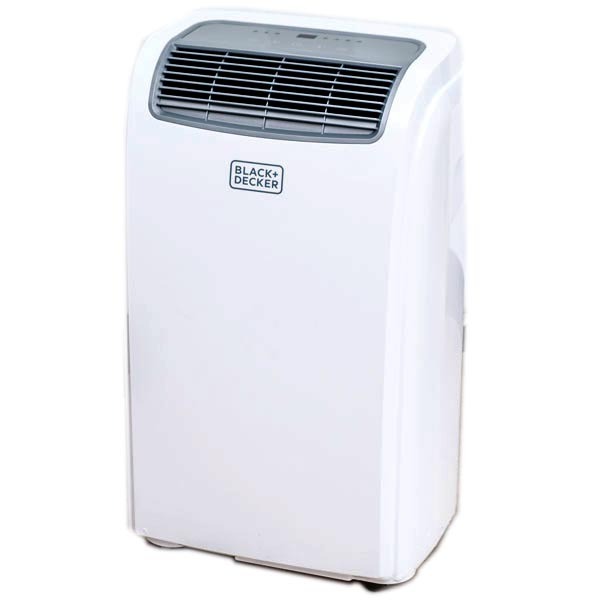 For portable air conditioners, BTUs estimate how much heat the unit can remove per hour. The larger the room, the higher that BTU number should be. 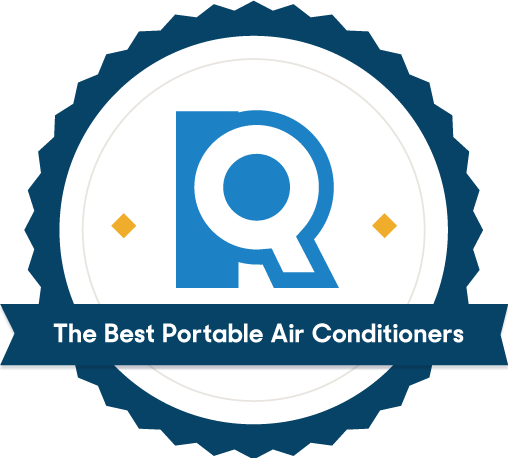 Portable air conditioners work by adding cool dry air into a room and venting out hot air via an exhaust hose, which you must install out a window or sliding glass door. More efficient units, designed for larger rooms, use two hoses to exhaust any heat the unit is creating itself. The dual hose units have higher BTUs, but they're also more expensive, heavier, and will have more impact on your energy bill. Getting the right size for your room is essential for effectively cooling the space. You’ll also want to overcompensate if you have high ceilings (eight feet or more), a space with lots of windows and/or appliances (a kitchen), live in a particular warm/humid region (Florida), or want to cool a room with poor insulation (a garage or workshop). Some portable air conditioning units come with energy-saving features and modes that can help you save on the cost of energy. Energy-saving features that only activate the fan cycles when the temperature of the room rises are indispensable, especially if you live somewhere warm. Another feature that can help is a unit with an oscillating fan. These help disperse the cold air, cooling more areas of the room faster. 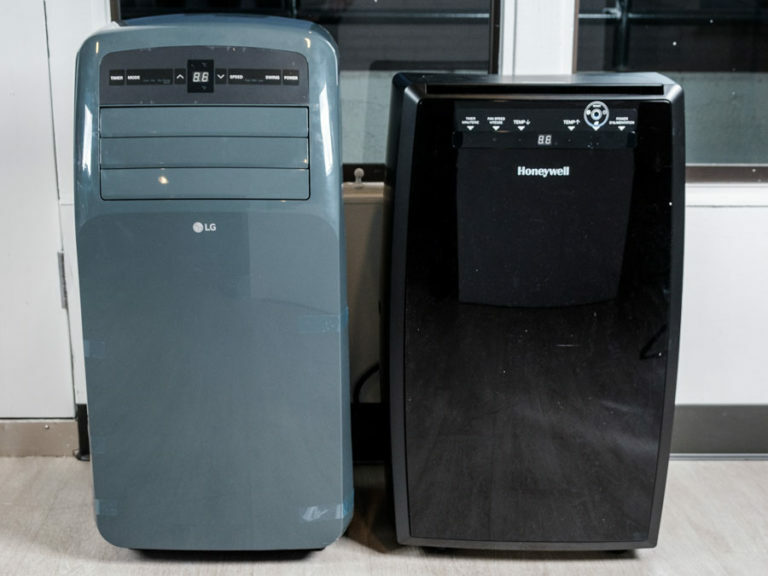 Do portable air conditioners really work? A portable air conditioning unit might seem small, but it can cool an area provided the unit is the right size for the right job. This comes down to the British Thermal Unit (BTU) rating of your portable air conditioner. A child’s bedroom or studio apartment requires 8,000 to 10,000 BTUs, while a larger family room or kitchen may require upwards of 14,000. Will a portable air conditioner work in a garage? 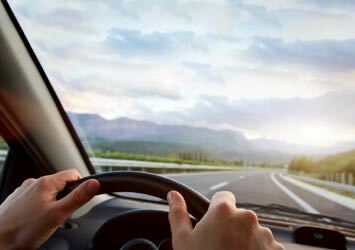 It’s hard to effectively cool a garage with a portable air conditioner, because many garages are not insulated — meaning there’s nothing keeping the cool air in or the hot air out. Even a powerful portable air conditioner will have trouble cooling a garage. While it may temporarily bring the temperature down, new hot air will cause it to come back on again. This on/off performance is known as short cycling and can reduce the life of your unit’s compressor. Is a portable air conditioner cheaper than central air? 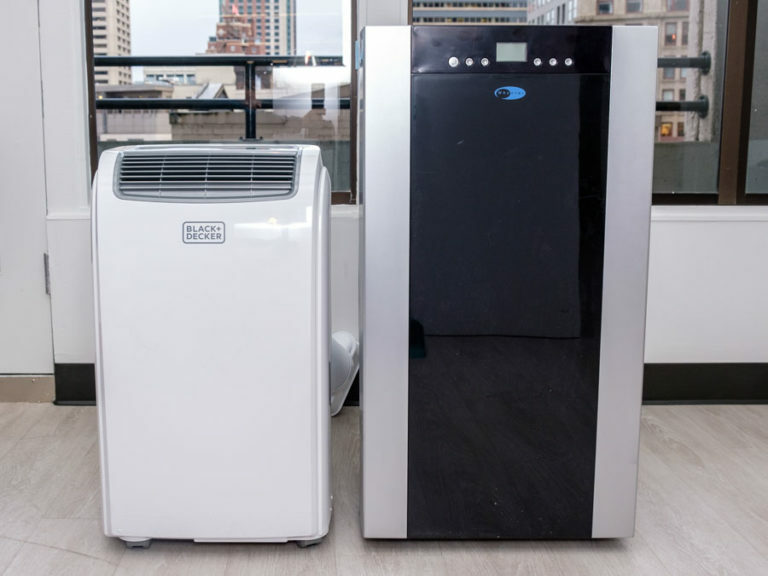 Depending on the size, a portable air conditioner could use less than an eighth of the power a central air system would use. You have to remember, however, that a portable unit is only designed to cool one area. If you only need certain areas cooled, then a zone approach using a portable unit can save you more money than using a central air system. 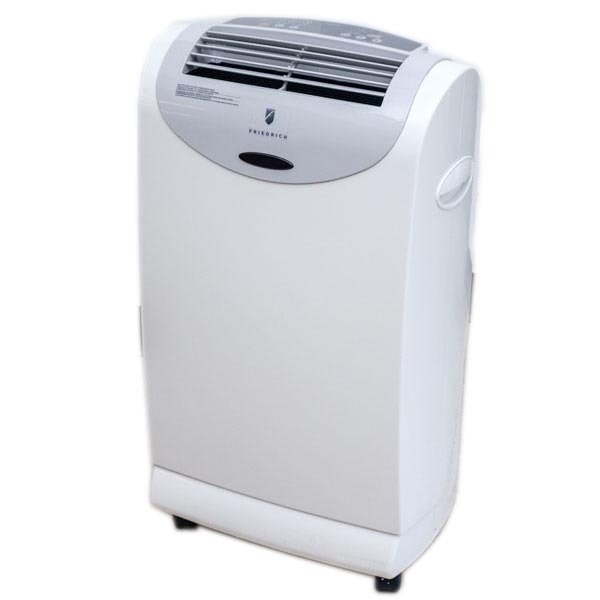 Do portable air conditioners need to be vented? Yes. Whether it’s through a window or a wall, your portable air conditioner must be vented. In order to effectively cool a room, your unit needs to be able to extract all of the warm air from the room and push it outside. Almost every portable air conditioning unit we tested came with an easy-to-install venting kit — no need for professional installation.